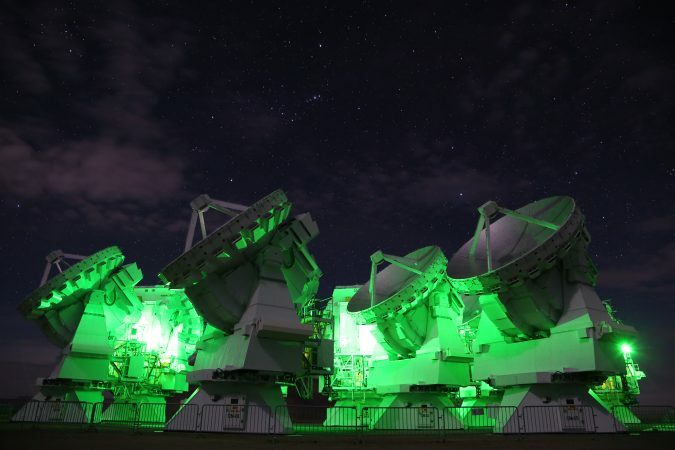 These long asked questions of the universe still remain a mystery, but they are about to be solved by the world’s most advanced telescope ALMA, a giant telescope that was constructed at an altitude of 5,000 meters in Chile and started its scientific observations from 2011. With a visual acuity of 120,000/20, ALMA is capable of capturing overwhelmingly high quality images of very weak radio waves emitted by gas and dust from which stars and planets are formed and materials that could be building blocks of life. ALMA has a mission to unveil the mechanism of planet formation and to find a clue to the origin of life in global partnership of 22 countries and regions including Japan. Here, you can get the picture of grand mysteries of the universe to be explored by ALMA and astronomical endeavors to address such big scientific challenges with ALMA. ALMA successfully received and imaged the radio waves emitted by a distant astronomical object as far as 13 billion light years away. 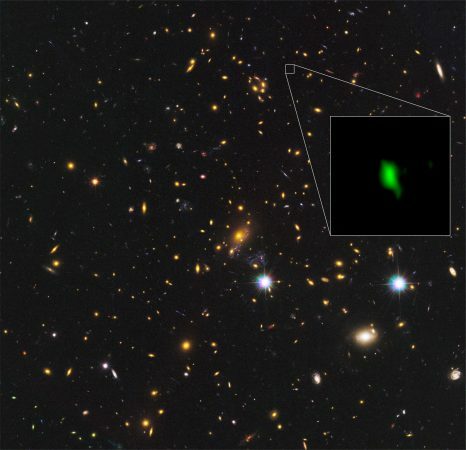 Lights and radio waves emitted by an object 13 billion light years away reach the Earth over a period of 13 billion years, which means the observed image shows what the object was like 13 billion years ago. In astronomical observations, “looking into far distance” is the same as “looking into the past”. From the observation above mentioned, it turned out that there was a high density of oxygen and dust in the objects already 13 billion years ago. It is believed that the universe was formed by the Big Bang that occurred 13.8 billion years ago. Then, when was the first galaxy formed and what was the scale of it, and how did it evolve? And another question is how was the Milky Way galaxy where our solar system resides formed? 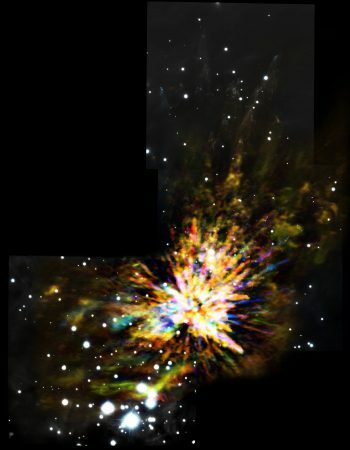 ALMA also targets mysterious astronomical objects such as a starburst galaxy (supposed to have occurred 12 billion years ago, and undergoing an explosively high rate of star formation, several hundreds of times higher than the Milky Way), which is thought to have significant impact on the evolution of the universe. With its overwhelmingly high resolution equivalent to a visual acuity of 120,000/20, ALMA aims to achieve another big goal to explore the formation and evolution of galaxies and reveal the history of the formation and evolution process. Artist’s conception of the history of the universe. 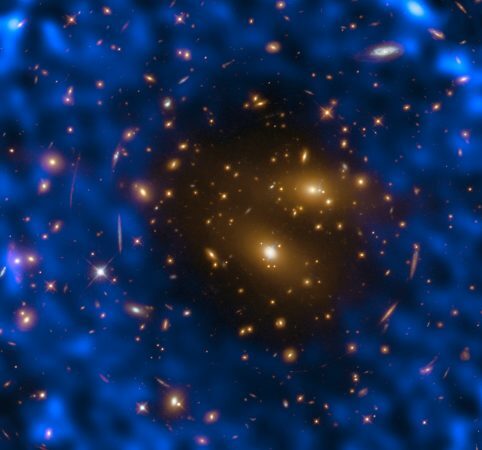 The universe started with the Big Bang 13.8 billion years ago and it is continuously expanding. From the Big Bang to the present, formation and evolution of stars and galaxies is a continuing process as shown. Galaxies about 10 billion light years away, imaged by ALMA and the Hubble Space Telescope. A galaxy 13.1 billion light years away, imaged by ALMA and the Subaru Telescope. Most of objects shining in the night sky are “fixed stars” that generate energy by themselves and emit light like the Sun. It is assumed that there are 100 billion times several hundreds of billion stars in the whole universe. From the results of many astronomical observational researches of stars and with the advancement of modern astronomy, it has been found that stars shining in the night sky also have various planets around them like our solar system. Then, how such planets were formed? And where and in what process is a planet that could be “Second Earth” formed? ALMA is capable of observing small dust and gas that will be ingredients of planets. By detailed observations of concentration of dust and gas, the process of planet formation will be clearly imaged. With ALMA producing remarkable results, astronomers are successfully revealing detailed images of planet forming regions that were never possible before. ALMA is continuously making observations toward its ultimate goal to establish a scenario of the birth of planets and unveil the origin of the diversity of planets. Where can we find the origin of life? Can the building blocks of life exist anywhere other than on the Earth or possibly everywhere in the universe? ALMA is also capable of capturing the image of dust and gas floating in space as well as organic materials such as amino acids contained in gas. Such observations will allow us to examine the probability of extraterrestrial life. The human body is made up of proteins that are composed of amino acids. If we could find the existence of amino acids in space, there might be a possibility of extraterrestrial life. ALMA aims to capture radio waves with specific wavelengths emitted by organic molecules such as amino acids and others. Using a revolutionary telescope ALMA, various types of complex organic molecules have already been found in planet forming regions. Although the existence of amino acids does not necessarily lead to the birth of life, ALMA observations may clarify the probability of the occurrence of life in the universe. Artist’s conception of evolution process from amino acids to living things. The key to solve such mysteries of the universe as mentioned above is to capture radio waves coming from the universe. Stars shining in the night sky emit visible light with a high surface temperature of several thousands to several tens of thousands degrees. Optical telescopes like Subaru can capture light emitted from stars. On the other hand, the temperature of planet-forming dust and gas and amino acids contained in gas is minus 260 degrees Celsius, which is too cold to emit light. ALMA receives radio waves emitted from dust and gas, and amino acids, to reveal the distribution and characteristics of materials that form galaxies, stars, and planets, as well as the building blocks of life. The image below shows the Antennae Galaxies, a merging pair of galaxies. This image reveals the distribution of cold gas that cannot be seen in optical spectrums by combining the results of radio observations with ALMA and the optical observations. ALMA observations cover a range of wavelengths called “millimeter/submillimeter” waves. There are other existing telescopes that observe millimeter/submillimeter waves, but ALMA is an outstanding telescope with exceptionally high sensitivity and resolution capable of imaging the unknown universe that was never possible to see before. Antennae galaxies observed by radio and optical observations. Radio image reveals the distribution of gas and dust that are invisible in optical spectrums. As demonstrated by one of the world’s largest telescope Subaru with a large aperture of 8.2 m in diameter, the larger size of the aperture allows us to capture weak light and waves with increased resolution (sharpness and clarity). To achieve this objective, astronomers have been making efforts to realize a telescope with a larger size of aperture. However, there are technical limitations in making a larger size of telescope beyond a certain diameter. One of the ideas to break through such limitations is to spread out multiple small-sized antennas over a large area and make them work together to function as a giant telescope. This is a mechanism called “interferometry” which is a technology applied to ALMA. ALMA is designed to combine a total of 66 antennas (composed of 54 twelve-meter antennas and 12 seven-meter antennas) to make a large radio telescope. 66 antennas of ALMA can be extended up to 16 km in diameter which is equivalent to the diameter of the Yamanote Line, a railway loop line that circles central Tokyo. 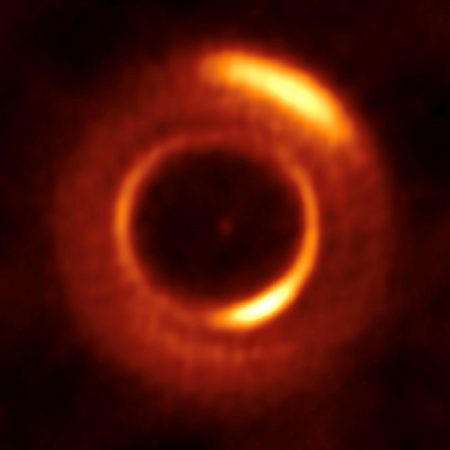 In this configuration, the aperture size of ALMA is virtually extended to 16 km, which allows the resolution equivalent to a visual acuity of 120,000/20 through which one could see an object the size of a one-cent coin from a distance 500 km away. The resolution of ALMA is 10 times higher than that of the Subaru Telescope or the Hubble Space Telescope, and several tens of times or 100 times higher than that existing millimeter/submillimeter telescopes. And, changing the antenna configuration works like a zoom lens of a camera. For a wide-field observation, antennas are arranged to a concentrated configuration with a smaller diameter, and for a high-resolution observation, antennas are extended to a larger diameter. Size comparison of ALMA antenna distribution (purple dots) and Yamanote line. 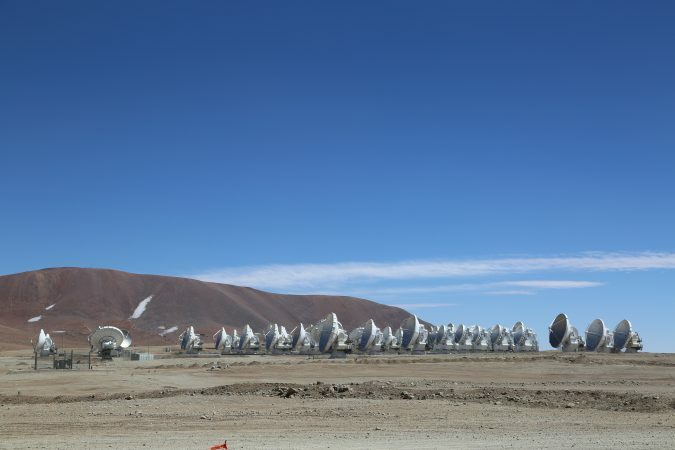 One of the requirements for the construction of ALMA was to select an observing site at a high altitude with dry and thin air, since millimeter/submillimeter waves observed by ALMA are very susceptible to atmospheric water vapor absorption on earth. And, another requirement was to find a vast and flat area to spread out a large number of antennas that function as a radio interferometer. Seeking for “the best observing site on earth” to meet the needs for the ambitious project ALMA, astronomers traveled around the world and conducted site surveys of high altitude sites. As a result of such efforts, they finally found a plateau at an altitude of 5000 m in the Atacama Desert, northern Chile. 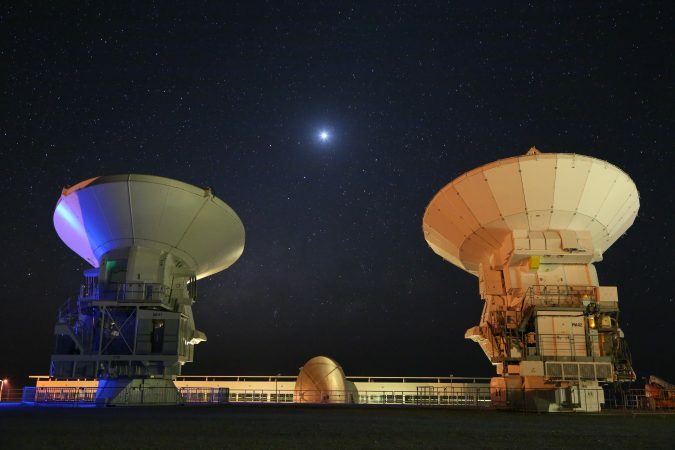 The Atacama Desert is considered as one of the driest areas in the world with the annual rainfall below 100 mm.For travelling from Japan, it takes 40 hours to get to the ALMA site in Chile including connection time. In spite of such long distance, the selected site is still the ultimate observing site on earth with ideal conditions for the ALMA telescope. A large-scale astronomical project like ALMA is not a project that can be developed or operated by one country. ALMA became possible by international collaboration among countries and regions that agreed to share human resources, technologies, and funds. In general, academic research is a field of fierce international competition, but also a field of amicable international collaboration where researchers are commonly working together beyond national boundaries. From the 1980’s through the 1990’s, researchers in Japan, Europe, and North America were respectively making plans for a large radio telescope. While sharing each other’s plans at international conferences, researches started to adopt advantageous schemes of the others for their own plans, which resulted in three region’s having very similar plans. In this situation, they came up the idea of integrating three different project plans into one to realize an ultimate telescope that cannot be possible by one country or one region. Eventually, they all agreed to launch ALMA as a joint project. Currently, ALMA is operated by East Asia including Japan, Taiwan, and Korea, North America including U.S. and Canada and 16 member states of the European Southern Observatory in cooperation of the Republic of Chile where the ALMA site is located. A dozen of NAOJ staff members from Japan are stationed in Chile to work for operations of ALMA in cooperation with researchers, engineers, and administration staff who came from all over the world. And, the ALMA Regional Support Centers (ASCs) have been established respectively in Japan, U.S. and Germany to provide support for astronomers who conduct research with ALMA in East Asia, North America, and Europe. In the international project ALMA, Japan shares contributions amounting to a quarter (25%) of the entire project. The Japanese contributions include 16 antennas out of the total 66 antennas, and 3 types of receiver cartridges out of 10. Japan also developed a supercomputer to process signals received by 16 Japanese antennas. Various Japanese cutting-edge technologies are integrated into ALMA. The parabolic antenna is a man-made object that have first contact with radio waves emitted by a celestial object from the far universe. To collect weak radio waves thoroughly, the antenna surface needs to be as smooth as possible. ALMA achieved an extremely high surface accuracy below 25 microns, which is equivalent to a third of the diameter of a human hair. The antenna requires high tracking accuracy to follow the movement of a target object. Achieving this level of accuracy wasn’t easy especially under harsh environmental conditions of the Atacama Desert with strong sunshine, large difference between day and night temperatures, and strong wind, etc. The Japanese antenna is designed with various inventive techniques such as a state-of-the-art system to automatically make real-time correction of the self-measured antenna deformation. Band 4, Band 8, and Band 10 developed by Japan. The receiver converts radio waves collected by the antennas into electrical signals for computer processing. In ALMA, the observed radio waves are divided into 10 frequency bands and then converted into electrical signals. For this purpose, ALMA has 10 types of receiver cartridges optimally designed for each band. A receiver for shorter wavelengths requires higher accuracy because detection of shorter waves is more difficult. Japan developed three types of receiver cartridges including Band 10 that covers the shortest wavelength with the world’s most advanced technologies such as superconducting technology and high-precision machining technology, and fabricated all receivers for the total 66 antennas. The ACA correlator processes the signals detected by the Atacama Compact Array developed by Japan. The correlator is a supercomputer to process electrical signals coming from the multiple antennas. The correlator developed by Japan is designed to process instantly enormous quantity of data transferred from the 16 Japanese antennas. Its processing capability is 256 GB per second; i.e. capable of processing 54 DVDs (single-side, single-layer) per second. The Atacama Compact Array (nicknamed “Morita Array”) is a system developed by Japan, which is composed of 16 Japanese antennas (out of the total 66 ALMA antennas), plus receiver and correlator. In a radio interferometer where multiple antennas are combined to work as a virtual giant telescope, increasing the space between antennas allows higher resolution but narrows the field of view. On the other hand, the observation of an extended object with a large field of view requires reducing the space between antennas. The Morita Array is designed to achieve such purpose by arranging small antennas to a compact configuration. In brief, ALMA made it possible to clearly image detailed structures of extended astronomical objects by combining two types of observations with the compact Morita Array and the 12-m array, developed by Europe and North America, which can be extended to a larger area. In addition, the name of the Morita Array was named after Koh-ichiro Morita, who was a professor at the National Astronomical Observatory of Japan and devoted tremendous efforts to the design of the array. To keep ALMA playing a leading role in frontline astronomical research, astronomers are now studying future development plans for further strengthening ALMA. Japan will continuously make contributions to the advancement of astronomy by incorporating various state-of-the-art Japanese technologies into ALMA. Compact configuration of the Atacama Compact Array (ACA or also called Morita Array) shown in the middle of the image.